Every month I write a what to buy piece for the Kent Farmers Market Association. Here’s your sneak preview! As we prepare to celebrate Easter at the start of the month, cooks are still waiting for the growing season to kick off. Signs of new life are just beginning to emerge after a hard winter for farmers and producers, who now need our support more than ever. Remember if we don’t patronise them, we, (and the wonderful countryside that they take care of, that sustains us and provides so much) will be the losers. So this April, with a rather restricted choice of fresh seasonal produce to choose from, why not make this the time to try some of the wonderful prepared and preserved products that add so much to our enjoyment of market visits. In recognition of these all talented people and their outstanding products, Kent has its very own food awards, The Taste of Kent Awards, with votes from 14,500 from members of the public for 11 different food categories). They recognize and reward the committed and hard working producers who do so much to promote this county and the quality of its ingredients. The 2013 entries have now been judged, and prizes were awarded at a special dinner on 8th March. You will find many of the award winning products at your local markets, with everything from fine cheeses, local beers, handmade chocolates and wonderful preserves all recognized. Visit for more details of award winners before your trip and then you will know what to look out for. Stand-out producers Cheesemakers of Canterbury were overall winners, taking three awards on the night. Look out for their award winning Canterbury Cobble and Bowyers Brie. Of course, despite the changing season, there is always plenty to tempt the cook whatever the month. Fish lovers will find sea bass, cod, halibut, cockles, and scallops all on offer, and if your fish stall has salmon from Scotland, it’s a good choice for an Easter meal that everyone always enjoys. For meat eaters, the earliest spring lamb will be starting to make an appearance. If it’s still too early for your local lambs then at Easter serve a wonderful joint of fine rare-breed beef. Another good choice is rose veal, produced here in England from calves raised on farms in association with the RSPCA’s Freedom Food programme. The name comes from its delicate pink colour. Mutton is also good now, and poultry fans should be searching out Guinea fowl. Game dealers are selling venison, hare, rabbit and wood pigeon and a good choice for the Easter weekend might be a fine game pie, either hot with plenty of savoury gravy or in a magnificent raised pie. If you don’t want to make your own, there are plenty of beautiful ready-made versions on offer. Cauliflowers, cabbages and kale are the vegetables of choice in April and as the palette turns to lighter foods with the longer days, lettuces, spinach and cucumber are appearing, and satisfy the desire for salads. Foragers are out after wild garlic so buy it if you see it – the white flowers should still be in bud for the best flavour. Wrap the leaves around fish before baking, or shred the leaves and use in soups, pasta dishes and risottos. 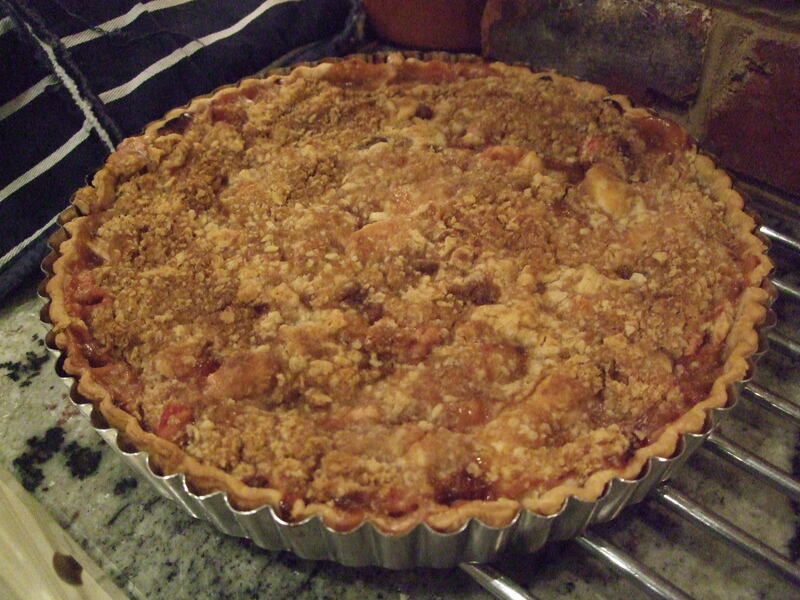 Keep on cooking with rhubarb, and make it into cakes, crumbles and compotes. A really good rhubarb fool is a seasonal pleasure, especially when made with local cream as the new grass is starting to add richness to the dairy produce. And local apples are still good as the storing varieties keep well into this month. This tart makes a great pudding for Easter Sunday or maybe a slice for tea later in the month. You can make it with other fruit such as apples, plums or peaches when in season. It also freezes well. Preheat the oven to 190C Gas Mark 5 and place a baking sheet in the oven. 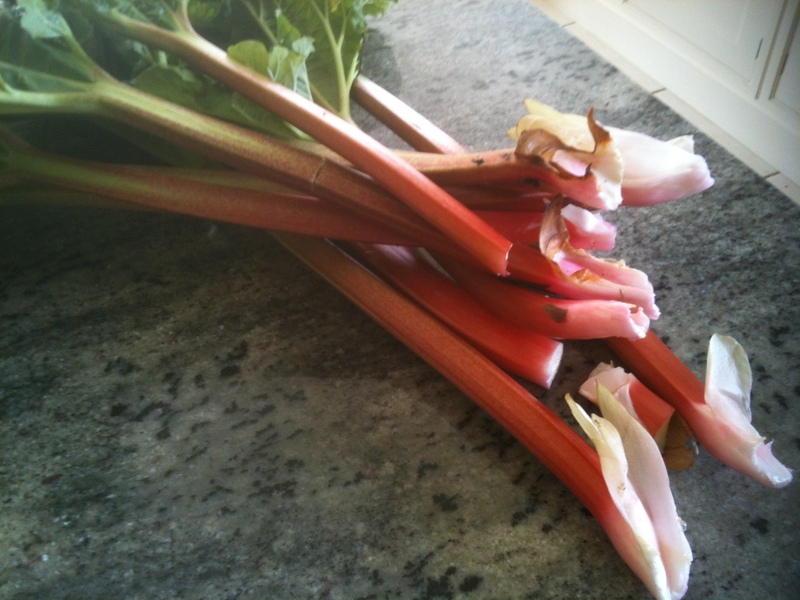 Toss the rhubarb with 50g of the sugar and 25g of the flour to coat. Spread over the base of the tart then spoon over the soured cream. Sift the remaining flour with the ginger and then rub in the butter until the mixture looks like fine breadcrumbs. Stir in the remaining sugar and sprinkle over the fruit and soured cream to cover. Bake on the heated baking sheet in the oven for 40 – 45 minutes until the topping is golden and the pastry cooked through. Serve warm or cold with vanilla ice cream or custard. This entry was posted in In season and tagged Cheesemakers of Canterbury, farmers markets, in season, recipes, Rhubarb, TAste of Kent awards. Bookmark the permalink.